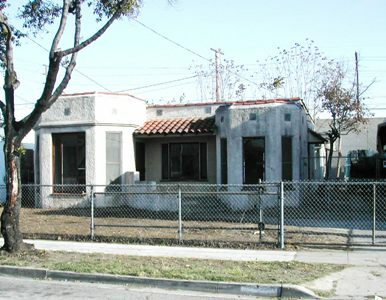 DESCRIPTION: GATED DUPLEX IN THE VERY DESIRABLE CITY OF HUNTINGTON PARK, CALIFORNIA. THE 2 BEDROOM, 1 BATH FRONT UNIT HAS A LIVING ROOM AND DINING AREA. KITCHEN WITH BREAKFAST ROOM. SERVICE PORCH. WOOD FLOORS. THE REAR 2 BEDROOM, 1 BATH UNIT HAS A LIVING ROOM & KITCHEN WITH BREAKFAST ROOM. SERVICE PORCH. THE BEDROOMS SHARE A CLOSET. SEPARATE GAS & ELECTRIC METERS FOR EACH UNIT. OWNER PASSED AWAY ON THE PROPERTY. BUYER WILL BE REQUIRED TO SUBMIT AN ASSUMPTION OF RESPONSIBILITY FORM TO THE CITY OF HUNTINGTON PARK, PRIOR TO THE CLOSE OF ESCROW FOR 3249 & 3249½ WALNUT STREET, HUNTINGTON PARK. BUYER WILL BE RESPONSIBLE TO MAKE ALL CITY REQUIRED REPAIRS, ETC. AFTER CLOSE OF ESCROW, AT BUYER’S EXPENSE. GREAT FIXER OPPORTUNITY. CLOSE TO SCHOOLS, SHOPPING & 710 FREEWAY. NO COURT CONFIRMATION. LOT SIZE: 5,877± SQ. FT.